Missing a tooth or teeth due to disease or an accident can cause issues with appearance, chewing as well as collapse of the bite with teeth shuffling and tilting into the gap. Dental implants are an effective way to replace teeth missing because of disease or an accident. They can be used to replace a single tooth, multiple teeth, or to support and stabilise a full set of dentures or a fixed bridge. They are considered the treatment of choice in the replacement of missing teeth because they have better long term success rates than alternatives such as dentures (false teeth) and bridges. Unlike dentures and bridges they don’t damage the neighbouring teeth by grinding down the teeth to fix the appliance. 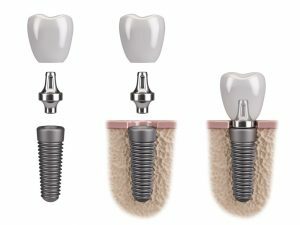 Dental implants are made of titanium, the same material used by Orthopaedic surgeons in hip and knee replacements and are biocompatible with bone and the body. The titanium implant integrates or adheres to the bone beneath the gums, a phenomenon known as osseointegration and is biocompatible. 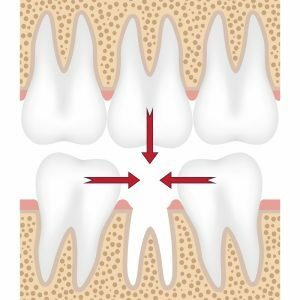 Once the implant has intergrated with the bone, a tooth form can be fixed on top to restore appearance, chewing function and prevent tilting of surrounding teeth and collapse of the bite. To achieve the best long term results dental implants require thorough planning, including moulds of your teeth, photos, and a 3D xray to see if there is enough bone to support a dental implant. Once the planning is completed by the dentist, a consultation appointment will be organised to go over the plan and discussed whether you are suitable for a dental implant. The implant is inserted at Tooth Dental clinical and usually takes around 1-2 hours to place. Medication will be prescribed to take immediately prior to your appointment to reduce the risk of infection and reduce any discomfort afterwards. Local anaesthesia is used to numb the area being worked on so the procedure is painless. If desired we have a range of sedation options e.g. happy gas to achieve optimal relaxation during the implant insertion. Some very minor swelling, bruising and discomfort after implant placement is normal and usually resolves after a few days. In some cases, especially if it has been more than a few months since your tooth was removed, the bone that previously supported your tooth will shrink and recede leaving insufficient space for the implant to be secured in bone. In this case a minor bone graft or gum graft or substitute may be required to increase the size of available bone. This is usually done in the same appointment as implant placement to minimise the number of appointments and requires extra care for the first few weeks to keep the area healthy as it heals. 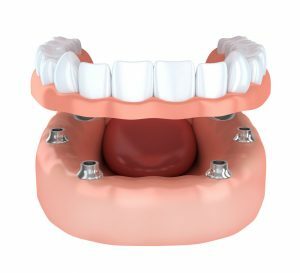 Following the insertion of the dental implant a waiting period of 3-6 months occurs to wait for the implant to adhere to the bone before a mould of the implant can be taken and an implant-supported tooth (abutment and crown) can be constructed. Dental implants require extra care and maintenance as they are more susceptible to the effects of gum disease than teeth. Thorough home care and oral hygiene is required with thorough brushing with a soft toothbrush twice daily and use of interdental brushes such as Pikters or use of Oral B superfloss daily. Regular 6 monthly reviews of your implant and implant-supported crown by your dentist are required to check the bite of the crown, check the gum health and clean the implant crown thoroughly. 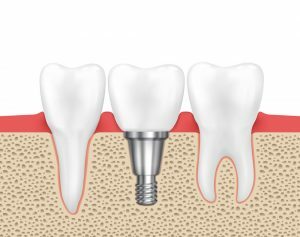 As with any dental procedure there are risks associated with dental implant treatment, and thorough planning aims to reduce these risks as much as possible. Risks and complications are case dependant and will be discussed with you during the planning of your implant. Click the button below to book a free Dental Implant Consultation!